Our bespoke software supports both salary packaging and client reimbursed expenses from online submission through to approval and subsequent payment. 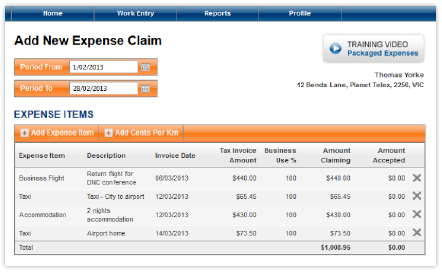 Client reimbursed expenses are attached to a timesheet, allowing for their streamlined approval and invoicing. Visibility is restricted by user account with each expense type linked to a ledger code, allowing for the automatic flow through to the chart of accounts and respective GST returns. Receipts can be uploaded directly against a claim and its status can be tracked from submitted to approved to paid. Our salary packaging platform supports novated car leases and general car expenditure, travel per diem, relocation and living away from home allowance, tax exempt expenses and general work expenses.